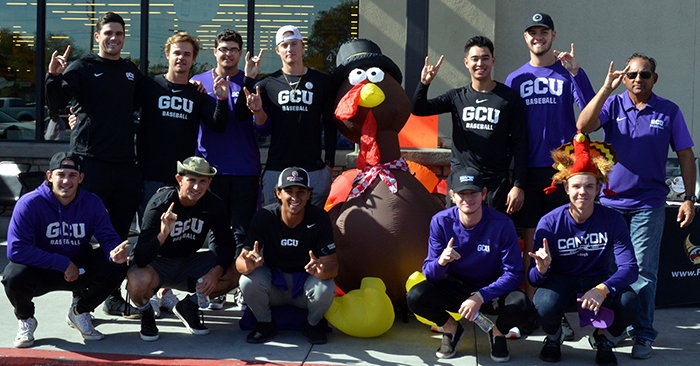 GCU baseball team members who took part in the Super Saturday Turkey Drive included: front row, from left, Tyler Wyatt, Austin Bull, Dane Stankiewicz, Michael Perzan and Joel Thomas; back row, from left, graduate assistant Kasey Coffman, Seth Beckstead, C.J. Schauwecker, Jake Jarvis, Jonny Weaver, Ben Kirke, Coach Andy Stankiewicz. 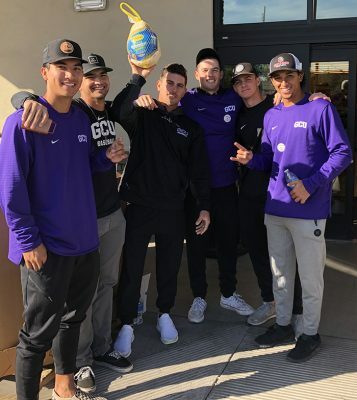 Fresh from an intrasquad pitching competition and a three-game series between the “purple’’ and the “white’’ squads, the Grand Canyon University baseball team was competing again on Saturday – this time for hungry Arizonans. The players manning the north doors to the Moon Valley Safeway were competing against the players manning the south doors to determine which group would encourage more shoppers to contribute to the St. Mary’s Food Bank Alliance Super Saturday Turkey Drive. The 12th annual event was held at SMFBA locations in Phoenix and Surprise, along with 28 Safeway and Albertsons locations across the Valley. 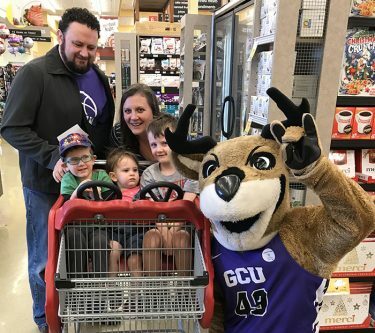 Thunder shows his Lopes Up with a GCU employee and his family. 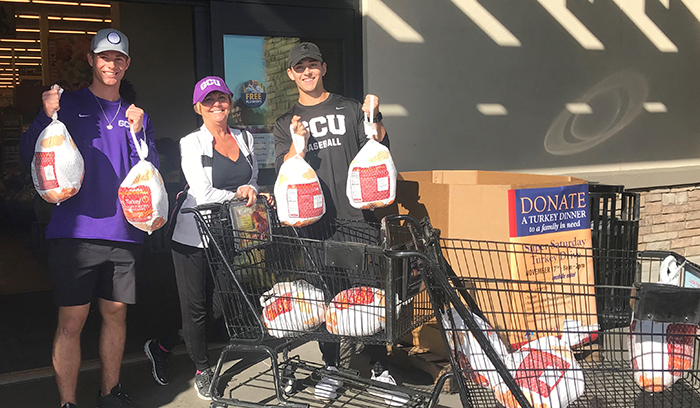 For the sixth year, coach Andy Stankiewicz and his players took on the role of encouraging shoppers to donate money or purchase turkeys and nonperishable food items as donations. 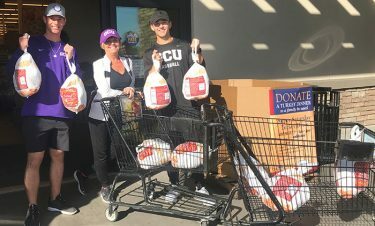 In 6 1/2 hours, shoppers donated $1,334.16 and a record 133 turkeys – more than double the amount donated at the Moon Valley location last year. With turkeys valued at $13 each, the total raised was approximately $3,000. Nate Gawelko, Josh Andrews, volunteer assistant coach Paul Panaccione, Kona Quiggle, Brock Burton and Dane Stankiewicz hold aloft a turkey donated by Panaccione. One team leader attributed the plethora of donations to the door vs. door competition. As with Wyatt, this was Bull’s fourth turkey drive. The smooth talking of Jonny Weaver, a freshman from Mountain Pointe High School, did not go unnoticed. 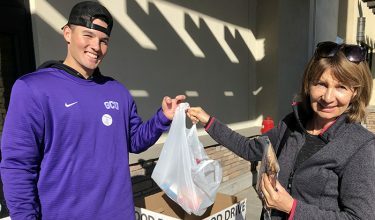 GCU Community Outreach manager Debbie Accomazzo was impressed with the willingness of the players to understand the plight of hungry people in the Valley and to impress upon shoppers that a $1 donation equals seven meals from SMFBA. 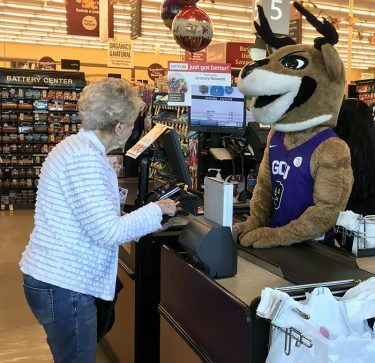 As the players informed shoppers about the SMFBA campaign when they entered each door and cheered them when they emerged with donations, Thunder interacted with shoppers inside, helping them load their carts and even temporarily taking over the cash register. Thunder took over the cash register at the Moon Valley Safeway. Jack Schneider and Nico Burgarello show off a few of the 10 turkeys purchased by one shopper. One woman bought 10 turkeys and dropped them off at the north door, manned by a group of players who intermittently chanted “turkey, turkey, turkey’’ and were quick to inform their “competitors’’ at the south door of their progress. “Forty-two turkeys over here,’’ hollered Antoine Mistico, a sophomore from Chandler. 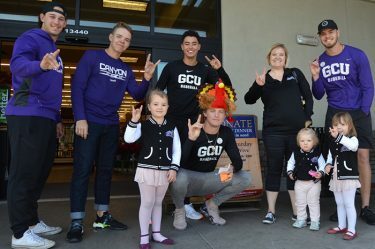 GCU employees shopped and donated, along with alumni, including the wife of a former Lopes baseball player. Volunteer Mo Harper became a GCU baseball convert. Tyler Wyatt, Joel Thomas, Jonny Weaver, Ben Kirke and Jake Jarvis (squatting) show their Lopes Up with GCU fans. Shannon Lewis, an SMFBA employee, was pleased with the fast start. At the south door, shopper Diane Davey handed a heavy, frozen turkey to Kona Quiggle, a junior from Greenway High School. Coach Stankiewicz wore the smile of a proud papa as he watched his players and three staff members interact with a steady stream of shoppers. Kona Quiggle helps shopper Diane Davey. ABC 13: St. Mary’s Food Bank seeks donations across the Valley.